6:30 am Ship docks at Port Canaveral – The magic came to an end as the ship docked at its home in Port Canaveral. A tip for first-time cruisers or anyone who wants to quickly face the reality that their vacation is over and they want to get back to their normal life as quick as possible is to walk off with their bags at 7 am. 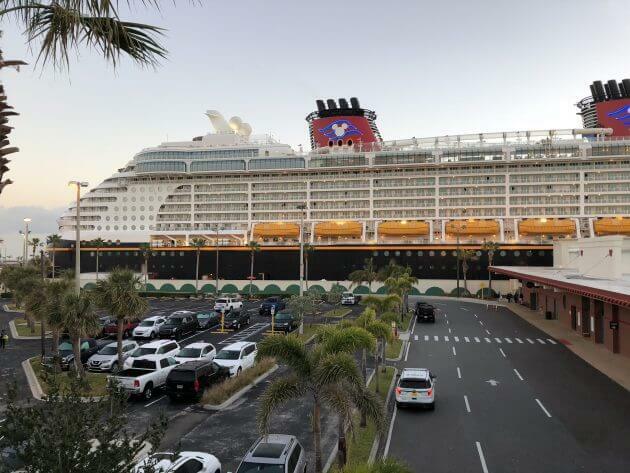 It is offered that you can leave your bags outside your door the night before the ship sails home to Port Canaveral so you can eat breakfast in the morning and not have to worry about carrying your luggage off the ship. And this is a nice option as you get to have one last meal before going back to real life, but this can lead to a lengthy baggage claim at the port. If you do decide to walk off with your bag, the process is rather quick. We left our room at 7:00 am and made it to our parked car by 7:15 am. Overall, I can say that I really enjoyed my cruise aboard the Disney Dream. The ship is beautiful and does a great job of capturing the essence and top-tier quality of Disney through its intricate details, captivating Disney-themed entertainment and delicious cuisine. I think in regard to the ship’s adult activities in comparison to other cruise lines such as Carnival and Royal Caribbean, there could be more options available. However, I do feel in comparison to cruises I’ve experienced in the past on both Carnival and Royal Caribbean, Disney Cruise Line does go above and beyond with its level of service, customer satisfaction, dining experiences and entertainment offerings.